Wolvix is probably one of the fastest rising distros today. 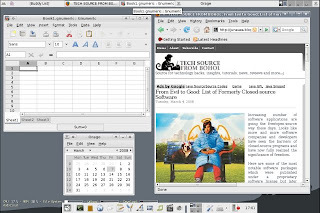 First released 2 years ago, it has already gained plenty of loyal followers and is steadily going up in the ranks of Linux distributions over at Distrowatch. In fact, I received a couple of comments from this blog and several emails encouraging me to try Wolvix. So what’s so special about this beastly-named distro? I’m here to find out. 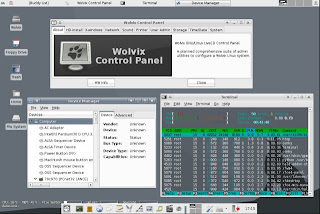 Wolvix, as described from its main website, is a LiveDistro built from Slackware and the Linux-Live scripts. It's a desktop and multimedia oriented Linux distribution designed to suit the needs of regular to advanced desktop users. 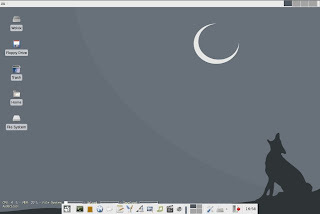 Wolvix comes with the XFCE desktop environment and the Fluxbox window manager and includes a carefully selected group of development, graphics, multimedia, and network and office applications. There are currently two flavors of Wolvix, namely Wolvix Cub and Wolvix Hunter. The latest version is 1.1.0. Since I’ve read plenty of reviews about Wolvix that were mostly for the Hunter Edition, I decided to get Wolvix Cub 1.1.0. By the way, the download page can be found HERE. 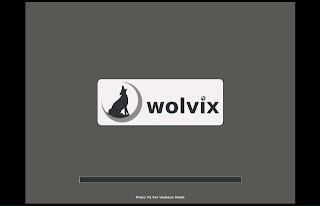 Wolvix is intended as a LiveCD and the developers said that their HD installer is still pretty much under development. They are actually quite modest when they said that. You will know why later on. Once I loaded the Wolvix Cub ISO, I was greeted with the traditional boot options screen. I was asked to press F1 for help and info before moving on. I’m glad that I did because I found the password for the root account there, and the "cheat codes" or the option parameters. And then, as I always do, I went on by just pressing “enter” without using any of the parameters whatsoever. The first boot started and then there was a long pause. I thought the system hanged or froze due to errors because the status bar on the boot splash image was not moving. So, I pressed F2 for verbose mode, and there I found out that the system is still booting but it was taking too long. I think it took about 5 minutes before I got in to the login screen. It was a relief to finally reach the desktop. I looked for the HD installer and found it inside the Wolvix Control Panel. I went on for the normal hard drive installation. Then, I was warned that the installer still needs improvement but I decided to push through since I have nothing to loose. The usual installation process began, like partitioning and copying of necessary system files and applications. The set-up was completed in less than 12 minutes without difficulty. That’s very impressive since I expected to encounter a problem during the installation after being warned that the installer is still under development. I’m very impressed, and I can say it over and over again. After the set-up, I rebooted and experienced the same painfully slow start-up. At login screen, I had an option to switch between the two desktop managers. The default is XFCE while FWM is the alternative. Wolvix has that clean gray look that can bee seen from its boot splash image to its default wallpaper. Its Murrine gray theme really blends well with the wallpaper I must say. 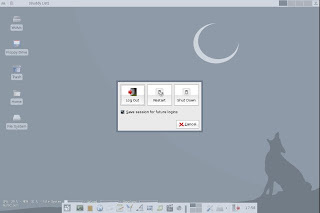 The desktop has a two-panel layout very similar to that of Zenwalk. I think the menus and icon arrangements were very newbie-friendly because most of the important applications were easily accessible. 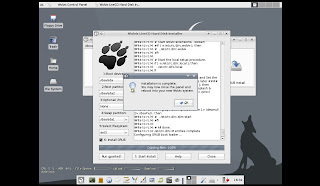 Wolvix Cub may be small, but it is packed with some of the most useful applications a distro can offer. 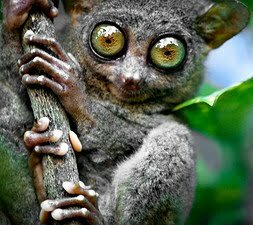 To name a few, there’s Abiword, Claws, Audacious, Mplayer, Python, Perl, Inkscape, Gimp, Firefox and more. Flash and other important multimedia plugins were even installed out-of-the-box. You can use the graphical package manager called Gslapt if you want to download and install some more packages from the repositories. If there wasn't that start-up issue, I would have given Wolvix Cub a perfect rating in terms of stability. Its hardware detection is just excellent. Everything was working as it should be like the USB, CDROM, and Ethernet. I was also able to change the display resolution without trouble. One thing I also like most about Wolvix is the very quick and responsive desktop. All applications that I’ve ran or tested just worked swiftly and perfectly well in Wolvix. Wolvix is really an amazing Linux distribution considering that it is developed and maintained by only two men. What’s even more amazing is that the original creator himself works at a construction as a painter. Know more about the man and his distro HERE. Minus the start-up setback, I can honestly say that Wolvix Cub 1.1.0 is one of the best Slackware-based distro that I've used so far. I think I should have tried the Hunter version since the reviews here, here, and here did not mention about a slow boot-up problem. All things considered, Wolvix is my kind of distro; fast, lightweight, and steady. I’ll be keeping an eye on future Wolvix releases. Yes, it's true, Wolvix is really a great distro. What keeps me from using it on a regular basis is that it doesn't have localization. I just want it to be in my language, in this case, german. I understand that only 2 guys building a distro have to keep their priorities straight. But I think offering more languages than english would increase wolvix' popularity considerably. What you said is true. Almost all kinds of software most especially an OS needs localization for it to really succeed. However, it will require an extra effort for it to be accomplished. 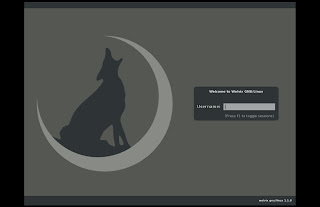 I'm also a Wolvix fan, although I have had some trouble with setting up the wi-fi in Wolvix Hunter (it seems to default on the normal network card and I haven't managed to make it use the wifi instead). Still, for typing up documents etc. 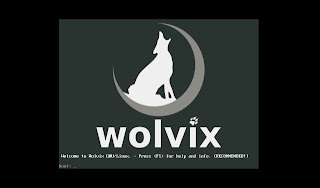 I prefer Wolvix over most other distros and OSs (might have something to do with me liking wolves very much ;) ). English as an OS language doesn't bother me one bit. I usually prefer English over Finnish anyway, since it's my main work language. disable eth0 and then in the wifi-radar.conf make the interface = ath0 (or wan0 whichever your network card uses). If your wireless card is detected by mad-wifi you should be able to connect straight away via wifi-radar, otherwise you can try using ndiswrapper & your cards windows driver. has a torrent link near the bottom but i'm a noob to torrents and to linux. Is it ok to try out an "alpha" version on my old machine? to stay up-to-date with this one!